It's a triangular arbitrage system (three pairs correlation system) to use 3 currencies for make 3 pairs to open hedge orders on those. Expert starts opening six orders for each ring (3 plus and 3 minus) and wait to move prices in one direction to make a grid of orders. Expert can to use maximum 8 currencies to make 28 pairs and make 56 rings. Can to input minimum three currencies and maximum eight. You can to get lite version for free from here. It's a multicurrency version of expert. Can to trade all rings from one chart. 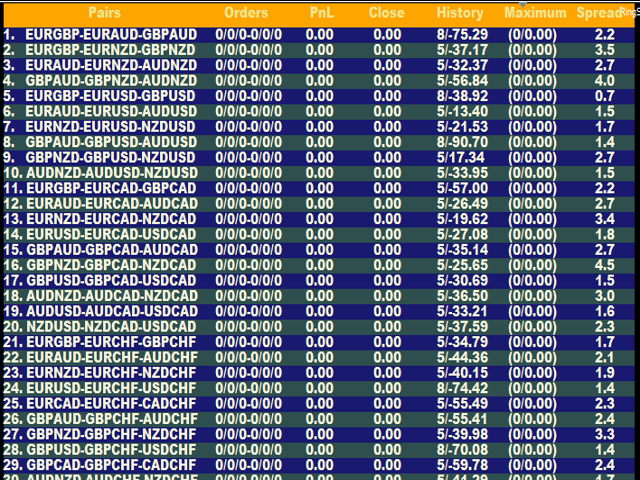 If your broker have limit of opened orders, please set expert to use less currencies. Default settings use 8 currencies. Please, don't change the series of currencies. Try to delete currencies of parameter, not typing currencies on parameter. 3 currencies = 1 ring. 4 currencies = 4 rings. 5 currencies = 10 rings. 6 currencies = 20 rings. 7 currencies = 35 rings. 8 currencies = 56 rings.